While my love of craft supplies knows no bounds, there are a few that are always at the top of my go-to list and pony beads are one of them. Pony bead crafts come in all shapes and sizes because there are just that versatile. The sky is the limit with these things because if you can imagine it in your head, you can more than likely make it with pony beads. Whether you’re melting them down for a sun catcher or stringing them together for a bracelet, these super simple pony bead craft ideas will keep you and the kiddos busy creating for quite some time and (BONUS! ), you’ll be getting some excellent fine motor practice in as well! Create your own little lizard friend with this awesome tutorial from Sugar Bee Crafts! Attach him to a backpack or just set him on your desk, he’ll look great anywhere! Need a little help identifying your stuff? Make a few of these personalized beaded keychains and you’ll never have to wonder what backpack belongs to which kid again! I’m a bit of a sucker for all things sparkly and I currently have a four-year-old who is in love with all things princess. So, these DIY fairy wands made out of pony beads? Yes, please! Need a little color on the back deck? 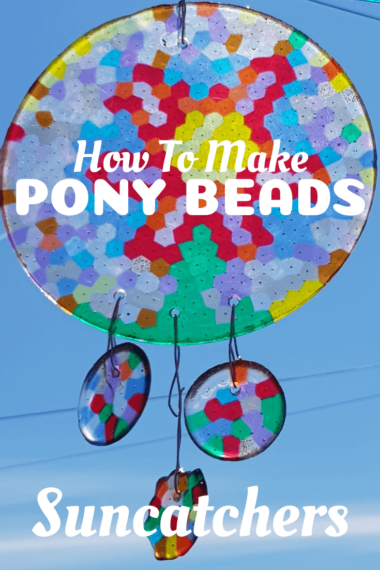 These pony bead stained glass suncatchers are not only gorgeous, they’re SO easy to make! Grab a couple of pipe cleaners along with your pony beads and make these adorable little pipe cleaner pals to take with you wherever you go! If you’ve got a little one that is into all things jewelry, why not let her make some of her own? These flower bracelets are the perfect place to start and she’ll have so much fun making it herself! Or throw together some quick and easy hair clips that will dress up any hairstyle in just a few minutes! Have a superhero fan at home? They’re going to LOVE these superhero bracelet patterns! Learning about the ocean? Those pony beads are absolutely perfect for a jellyfish craft! Or, if you’re planning a trip, try making a phone number bracelet! This will come in handy if anyone in your party gets separated from one another! Don’t put those pipe cleaners away just yet! You’ll need them for this last one! This adorable hungry caterpillar pony bead craft makes the perfect companion for story time. He can even help your little ones recreate the story. Now all you need are the pony beads to get crafting!